This is the second book in the “Temeraire” series. This is where we first discover Novik’s penchant for investigating other nations from the same historical period. And, given that the series is about dragons, China makes a whole lot of sense. China has a whole lot of dragons, and Great Britain is just very lucky they’re not interested in the war. Or are they? Temeraire is an extremely rare and valuable Chinese dragon, and his egg was captured on a French ship. This means two things – first, it seems the Chinese may be interested in the war after all, and on the side of the baddies. Second, the Chinese are mightily offended that Laurence – a nobody in their eyes – is captain to their precious dragon. And so Laurence and Temeraire are sent to China to do whatever it takes to conciliate the Chinese. Everyone in both countries seems to want to separate the pair by any means necessary. And so Laurence and Temeraire enter a minefield of cultural stubbornness and misunderstandings. Laurence, loyal Englishman to his core, can’t help but be uncomfortable to see dragons treated so much better in China than in his own great nation. 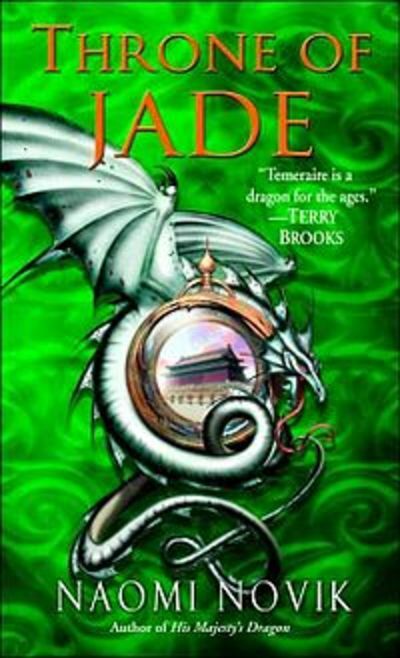 Temeraire is still young and very impressionable, and what he sees and does in China has a huge effect on the rest of the books. This book is still beautifully, brilliantly written, but it’s my least favourite of the series. Laurence and Temeraire are SO good to Great Britain, and Great Britain treats them so badly, over and over again. I find that level of stupidity painful to read, much as it adds drama to the book. But most painful of all was the array of cultural misunderstandings. Even Laurence was deeply stupid once or twice, and no-one, not even the diplomat, seemed to have the slightest understanding of the fact that cultures are different – some aspects are negotiable, and some aren’t. I felt much like I feel when travelling overseas and I see another English speaker, lost due to their own stupidity, attempting to communicate to a non-English speaker by yelling ever more loudly (which, sidebar, is why I won’t be seeing “John Carter”).